The not-so-public, rarely used rooftop on the 25th floor of M1NT with sprawling views of the entire city is all ours on Friday night, April 28th. This will be the first event of our brand new InterNations Ambassador, Weino Wang! An accomplished business woman that has done everything from News Anchor in New York to founding a successful fashion company…come meet her! M1NT is one of the most iconic clubs in Shanghai known for putting out some of the coolest vibes in the city. 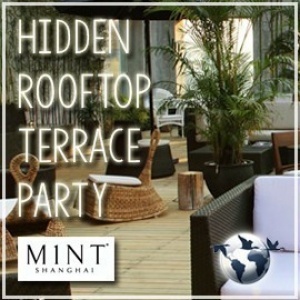 After the Rooftop Party, members may join the afterparty in the relaxed MINT VIP Lounge or in the more active MINT Club area for dancing. MINT IS an exclusive club so you will need to tell the 1st floor reception a password to get in. Simply use your InterNation Ambassador's names: Jared & Weino. Then you will be shown to the rooftop. Please dress Smart Casual and be ready to meet a lot of wonderful people.